The TaylorMade CGB Max 2008 irons have maximum technology for maximum speed, distance, forgiveness, and accuracy. They feature a large, thin, flexible, and fast clubface for a higher COR and more distance. The extra-large clubhead provides an ultra-high MOI that makes it extremely forgiving and easy to hit. 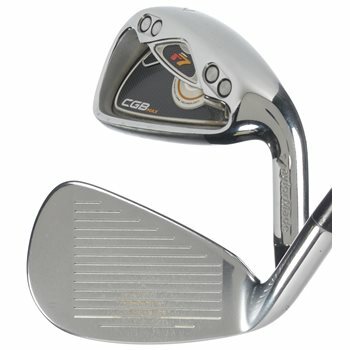 Its Center of Gravity Back (CGB) makes launching the ball high and long incredibly easy for more carry and distance. Thin, fast 17-4 stainless steel face for maximum ball speed. Hollow top-line and toe=heel tungsten weights create an extremely low center of gravity for optimal trajectory. SuperFast Technology with a lightweight grip and shaft creates more clubhead speed for more distance. Inverted Cone Technology (ICT) creates higher ball speed on off-center hits for more distance from shot to shot.